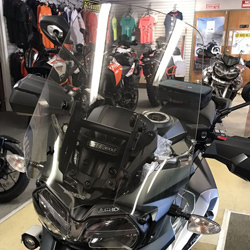 18" Screen - height range up to 5'8"
20" Screen - height range 5'9" - 5'11"
Sit on the bike with a ruler or tape measure straight up from the top edge of the instrument panel (see larger image). Look straight ahead and estimate about where your chin level is, then add either 9" or 10", whichever gets you to an even number. For example, if you estimate chin level at about 10" on the tape then you would order the 20" windshield. This is where the top edge of the 20" screen will be when set at the lowest possible position. !screens, low, xc, xca, xr, xcx, xrx, xrt, 1200xc, 1200xca, 1200xr, 1200xcx, 1200xrx, 1200xrt, 17, 18, 19, 20, 2017, 2018, 2019, 2020!